In Buenos Aires you will also find this kind of bars. Some of them required a password to enter and others they are opened to everybody. 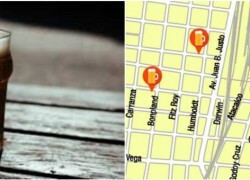 In this post we are going to tell you about a few bars that you can find in the city. On our way to the Recoleta Cemetery, as we walk in the free morning tour we pass next to Florería Atlántico. This place looks as a flower shop by the day, where you can also buy wine, but at night they open a fake fridge and you enter an exclusive bar. Frank’s bar is another popular invisible bar that you may find in Buenos Aires. Here you will listen to jazz and music from the 80’s and 90’s. To enter to this bar you will need a password that is revealed through their social networks. Victoria Brown is another speak easy bar that you will find in Palermo. It is inspired in the Victorian period with the clash of the tradition and modernism. To enter the bar you need to send a list with the names to the bar. In this experience you will have the opportunity to discover the hidden Buenos Aires, with a retro atmosphere. its almost hard to argue with you (not that I really would desire… HaHa). subject thats been written about for years. Fantastic stuff, just great!